I have one major complaint about the "Pilot" episode of A Million Little Things, something which I believe my fester and eventually kill my interest in the show, but there is actually quite a bit of good to talk about first. The set-up involves two friends in a small circle both attempting suicide on the same day. One dies (Ron Livingston), and the other (Romany Malco), after learning of his friend's death, chooses to remain in the land of the living. During the lead up to the funeral, we introduced to the group which includes the departed man's wife Sopie (Lizzy Greene), breast cancer survivor and womanizer Gary (James Roday), the depressed Rome (Malco), and the unemployed former rocker turn music teacher Eddie (David Giuntoli). Rounding out the cast are the men's signigant others (Christina Marie Moses, Grace Park, and Allison Miller). What show creator DJ Nash does so well is balance the range of emotions for a large group of friends. The use of flashbacks allows us to see John with the others and the introduction of Gary's new love interest (Miller) the day of the funeral allows for an audience stand-in to learn more about each character during highly-emotional events. 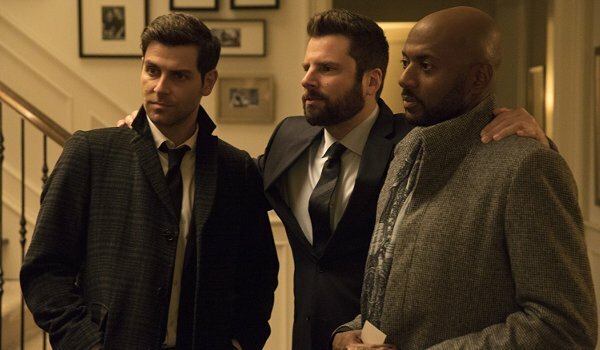 Roday is very interesting here, with his regular charm and manic energy that is tempered by understanding of his own mortality and anger at the loss of his friend. While the show doesn't explain the reason for either attempted suicide (other than Rome's confession to his friends what he was about to do), I'm guessing we'll get more clues as the season goes along. Over the course of the episode we learn the four men met years before while being stranded in an elevator together for hours. Bonding over their love of the Bruins, the group has stayed close ever since. The death of John rocks the rest to the core, especially since the his secretary (Stephanie Szostak) doesn't share John's suicide note and destroys evidence shorty thereafter. For a show already filled with dramatic moments, many of which feel quite genuine, this manufactured mystery drama feels cheap and hackneyed. While it doesn't do much to hurt the episode, it does raise some red flags for me as to where the show may be headed. Realizing that the search for meaning of their friends' death is going to be one of the driving forces of the show, I'm disheartened by its inclusion and fear how much time will be devoted to it in the episodes to come.